I wonder who came up with this brilliant idea..
That is the funniest thing. Where can I get a baby, though? ha ha, i seen this on Ellen. she did a series of episodes where she had weird products from japan and china. @Kavita, I was wondering about the same thing. Is this brillant and absolutely insane?? lazy king....its brilliant when you have kids(kiddin)....its weird actually. Yes now for the first time ever YOU, yes YOU, will be able to have a self-cleaning system in your house, Its practical, Functional, Cheap and Easy. 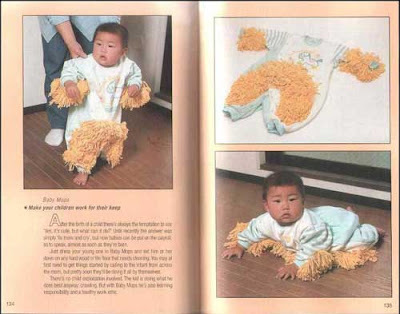 No problems*, No Mess*, Nobody has to clean*- GET YOUR SUPER BABY CLEANING APPARATUS AT *WERY*MARK TODAY! *terms and conditions apply, while stocks last. Hello baby.. thank you very much for following my blog. I think your blog is quite unique, creative and cool..
Bwha ha ha, be very afraid because I might take you up on that offer. Okay, you don't need to be afraid at all. Great idea, waaaay better then the mop version.